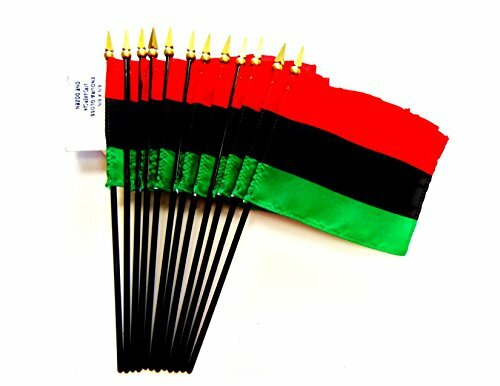 Deluxe US made desk and table flags measure 4"x6" and are attached to a 10" black plastic staff with a gold spear top. Each flag is hem stitched on all 4 sides and is made of high quality rayon. These flags come in a custom cardboard box, specifically made for these flags. Order by 2pm eastern time Monday through Friday excluding holidays and most orders ship the same day from the state of Georgia in the USA. Top quality deluxe miniature flags are Made in the USA. These are not cheap polyester or cotton flags, these are the highest quality American Made table flags on the market. Only $1.50 each for 12 top of the line American Made Flags.